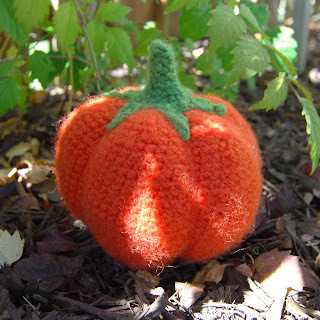 As you'll probably note, my pumpkin is what I'd call "gently felted." In other words, I don't have the capability to machine felt my projects (it just doesn't work well with one of those front-loading high-efficiency washers), so I used hot water and detergent in the kitchen sink along with a clean scrub brush. My felted pumpkin is actually a little larger than the original pumpkin used in the Pumpkin #1 pattern photographs (I expect that is due to the difference in yarn). I am really curious to see whether someone who has machine felted one of the pumpkins notices a significant change in size. FYI -- The yarn used was Debbie Stoller's Full O' Sheep and it is a DELIGHT to work with. Then again, who would have expected anything less? Well, I'd better get a move-on... lesson one for the crochet-along isn't going to write itself after all! I think I signed up for your CAL. I saw it on Ravelry. If I am not signed up, please let me know. 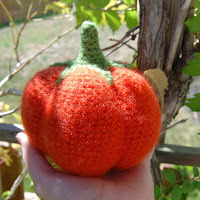 Amy -- do you have a copy of the pattern for pumpkin #1 and access to the Flikr group? If you have both, then you're signed up. Otherwise, send me an email at ibscrochet [at] gmail [dot] com with your email address and I'll get you added.